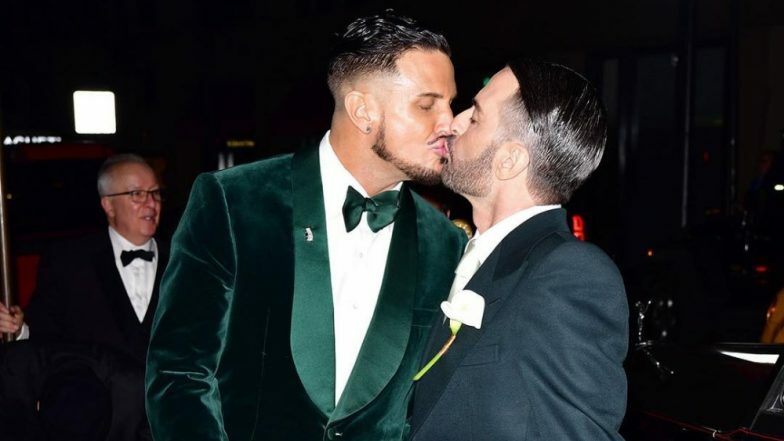 Celebrated fashion designer Marc Jacobs married his boyfriend Charly "Char" Defrancesco in an intimate ceremony. The couple got engaged a year ago after an elaborate flashmob sequence that took place in Chipotle. The wedding was quite intimate as only specific guests were invited. The wedding took place in New York City while the reception was held at The Grill in Midtown. The wedding guests were treated with some personal home videos and picture montages of the newlyweds. Apart from Jacobs and Defrancesco's cute wedding vows, the other highlights from the ceremony were animals as true-love mascots. The couple wore a very adorable marching diamond and onyx penguin pins. perhaps it had to do with the monogamous nature of penguins that made them use it as a symbol? As per Elle, the pins were a gift from Prada and Miu Miu's design director Fabio Zambernardi. Jacobs took to Instagram to share details of his wedding ensemble too! He wrote, "Verified God is in the details. One of the pair of Art Deco Diamond and Onyx Penguins. An extraordinarily beautiful and thoughtful gift to us by the amazing, lovely and generous @zambishot Penguins have only one partner and mate for life. A great example of faithfulness and fidelity. So grateful to you and love you so much dear Fabio." For the reception, while Jacobs donned a debonair suit, Char opted for a handsome green velveteen blazer. Check it out below! Present at the wedding were Kate Moss, Kaia Gerber, Bella and Gigi Hadid, Emily Ratajkowski, Christy Turlington, Rita Ora, and Erika Jayne. Other celebs from the fashion fraternity included Katie Grand, Anna Sui, and Pat McGrath. Congratulations to the newlyweds!